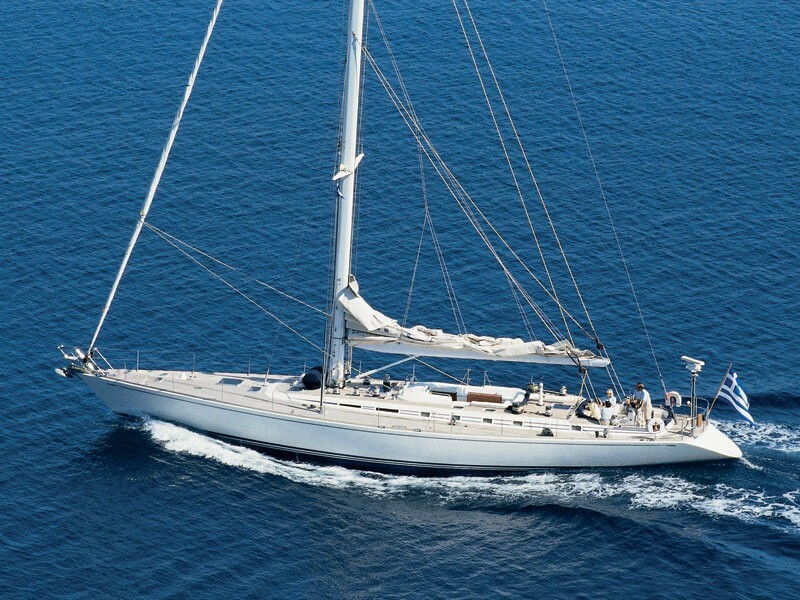 Luxury sailing yacht CALLISTO is a beautifully restored Swan was built by Nautor of Finland and is available for yacht charter in Greece. 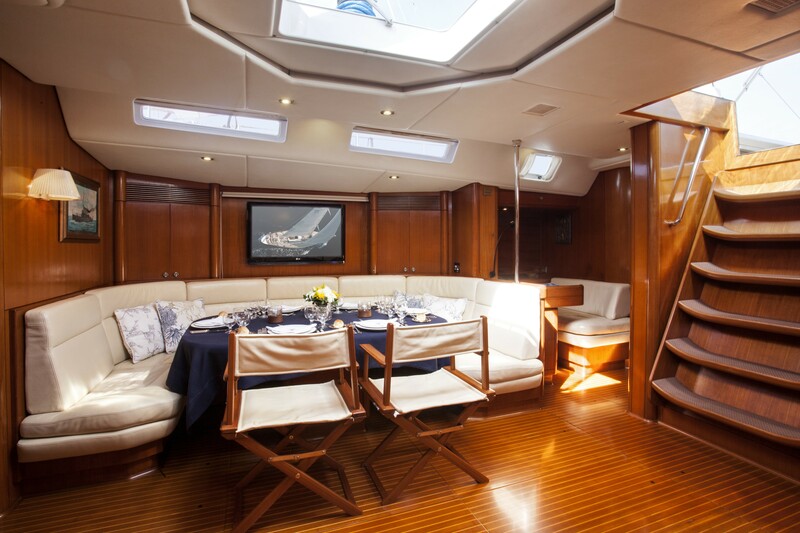 Recently refitted, both her interior and exterior are immaculate, both the Jib and the mainsail are new in 2008 and her rigging represents the cutting edge of racing yacht technology. 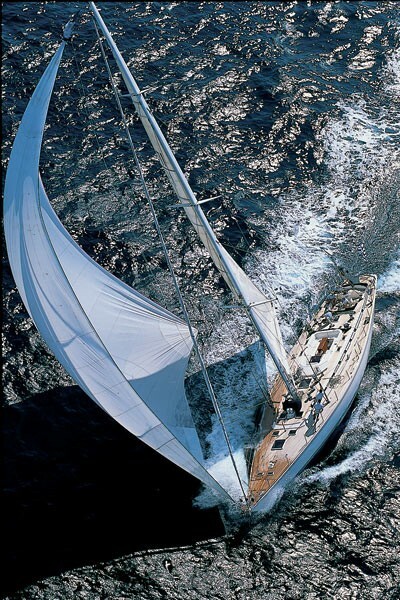 Her hull is not only beautiful but very quick in the water making her an exhilarating ride. 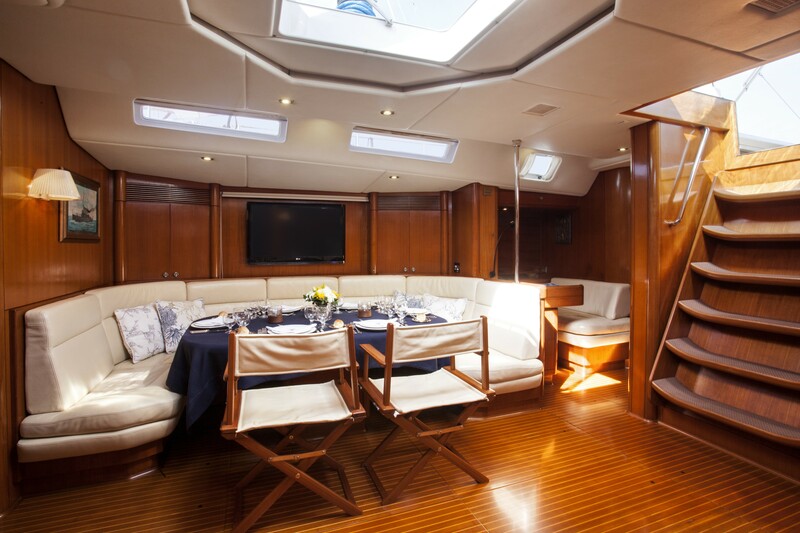 Luxury yacht Callisto’s aft cockpit offers comfortable seating for up to eight people, and all of the controls for the sails are within easy reach making her very easy to maneuver. 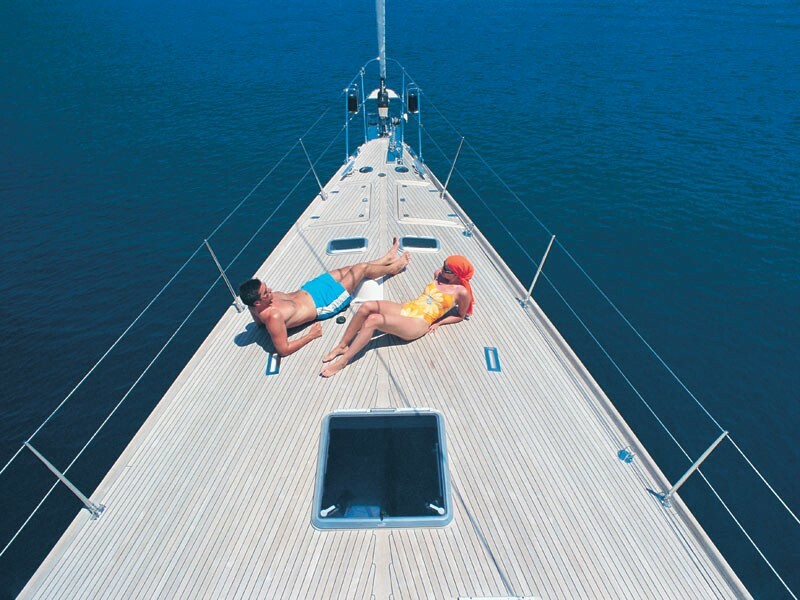 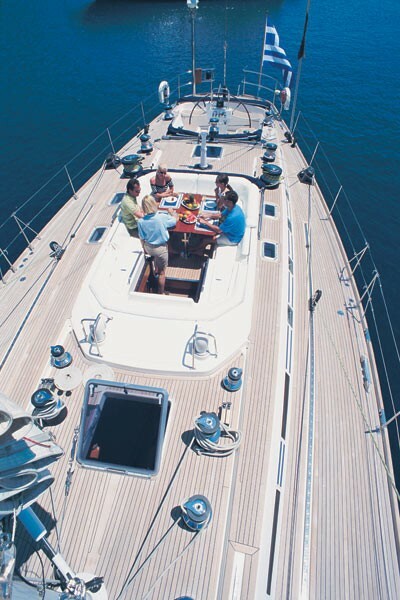 All hinges, hatches and fittings are flush to the beautiful teak deck which allows plenty of room to lounge and enjoy the wonderful Greek vistas while soaking up the Mediterranean sunshine. 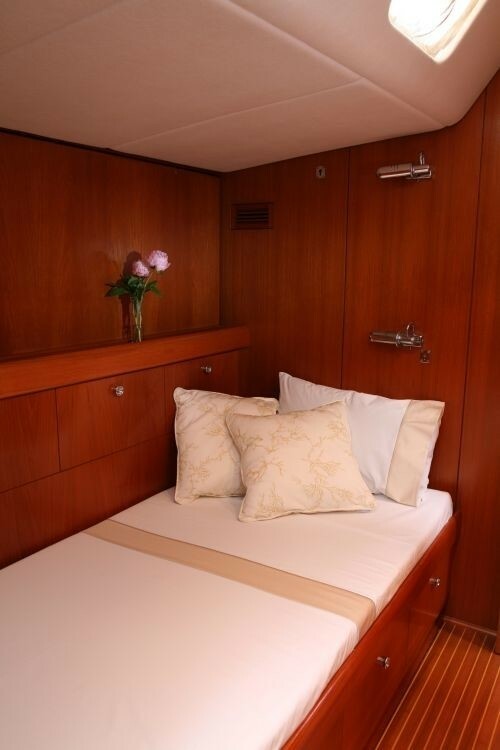 Callisto accommodates six passengers in three cabins – one large master cabin and two double cabins, all of which have en suite bathrooms. 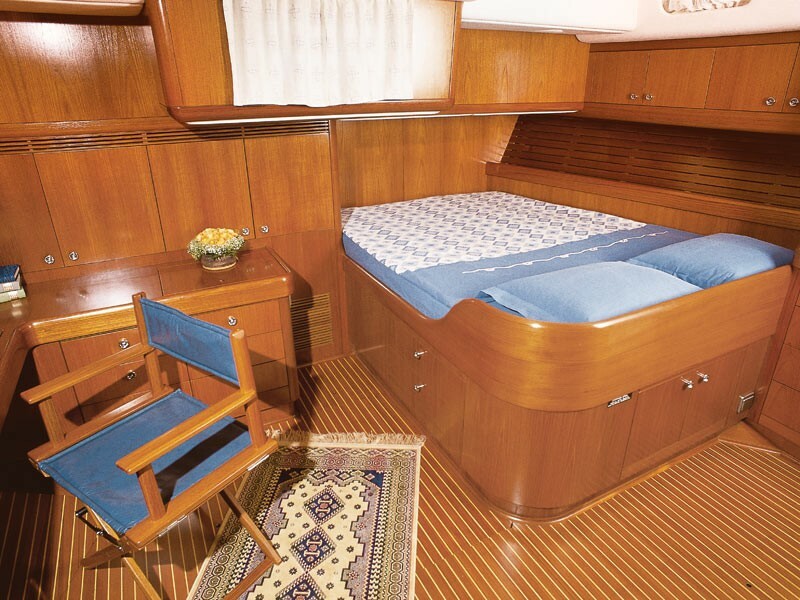 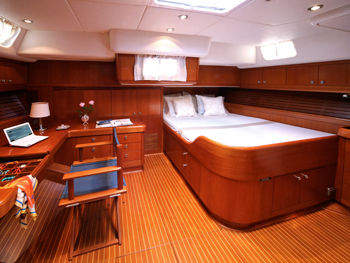 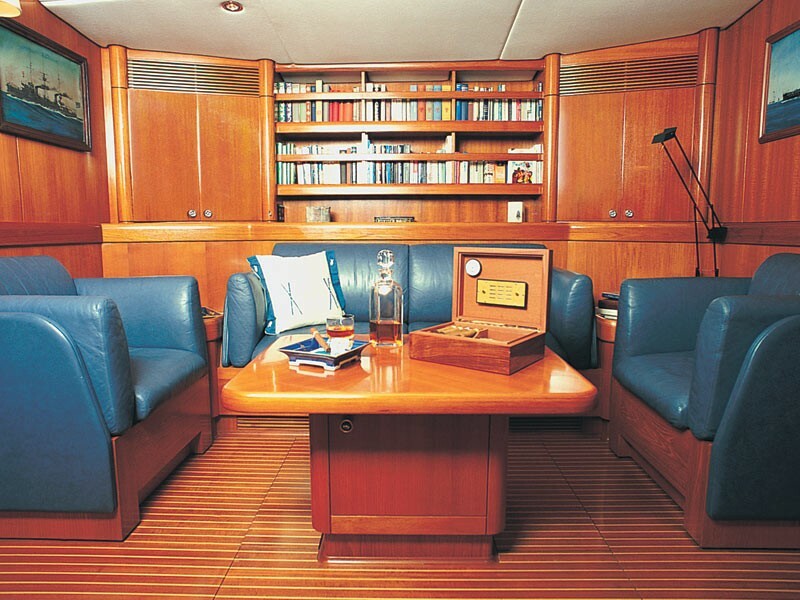 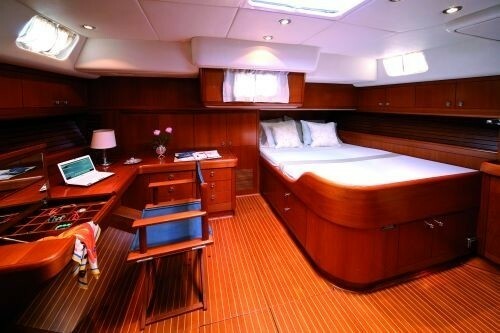 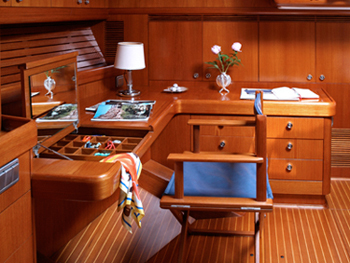 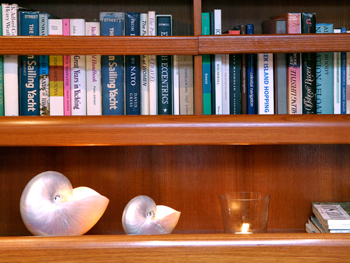 The stunning master stateroom is finished in teak and features a queen-sized bed, lounge area and desk. 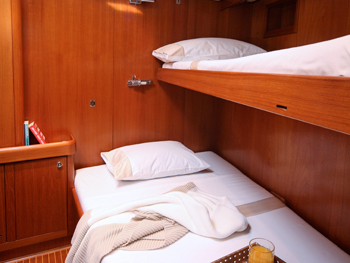 The double guest cabins have a double and single bed. 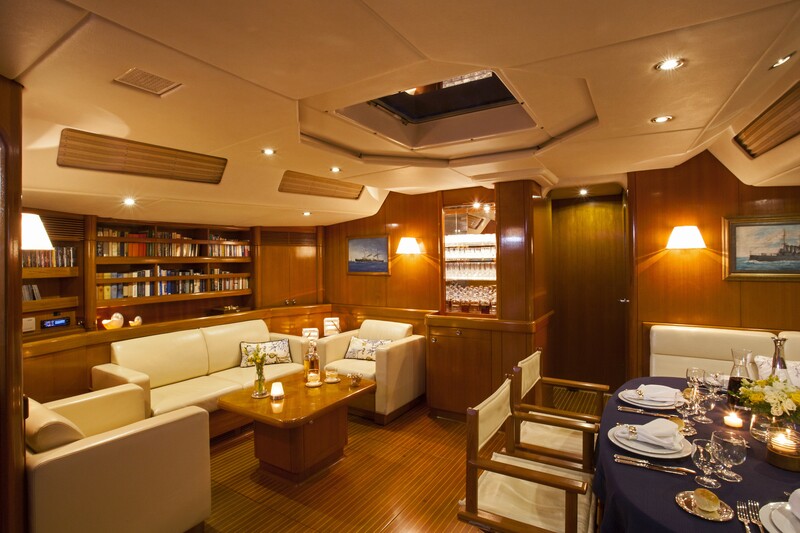 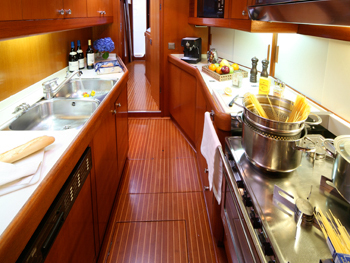 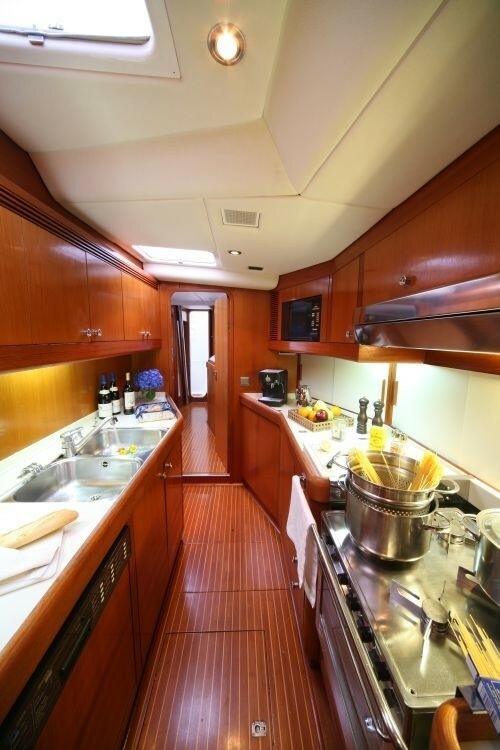 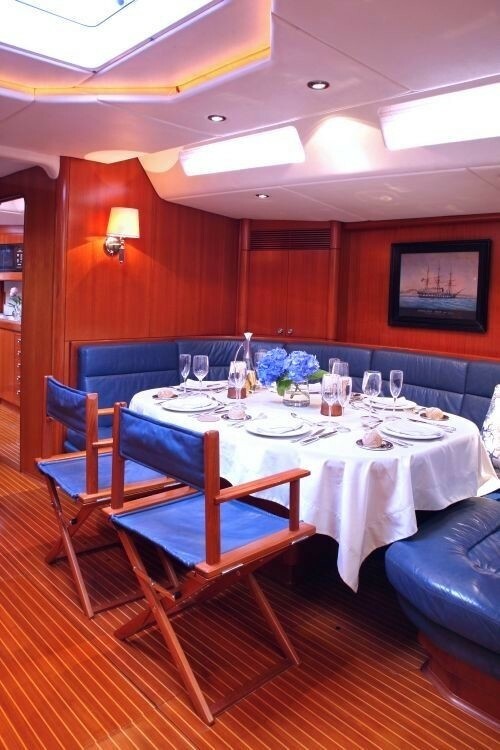 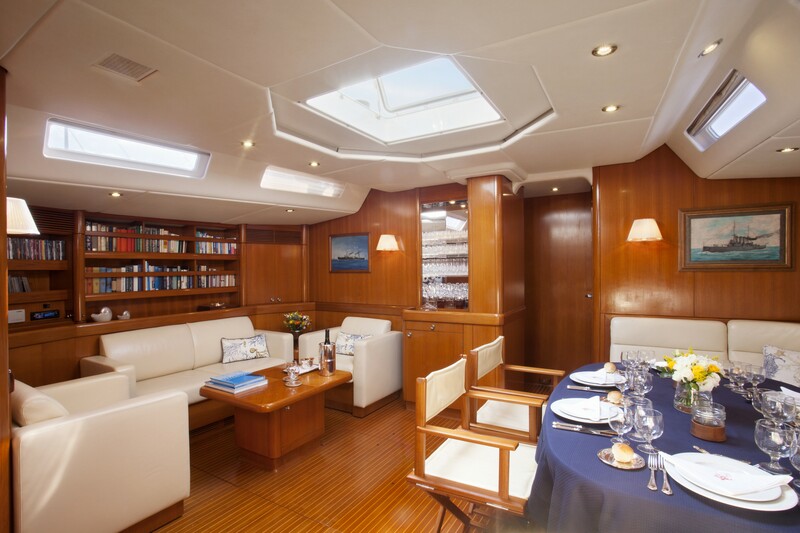 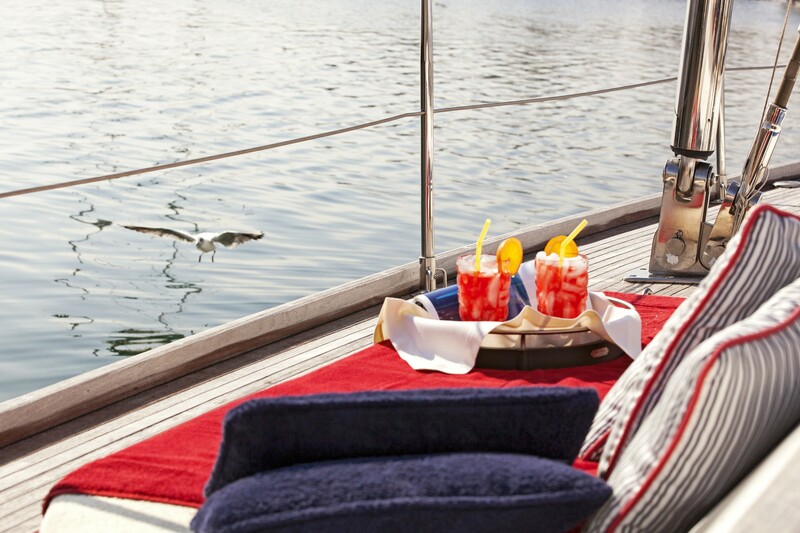 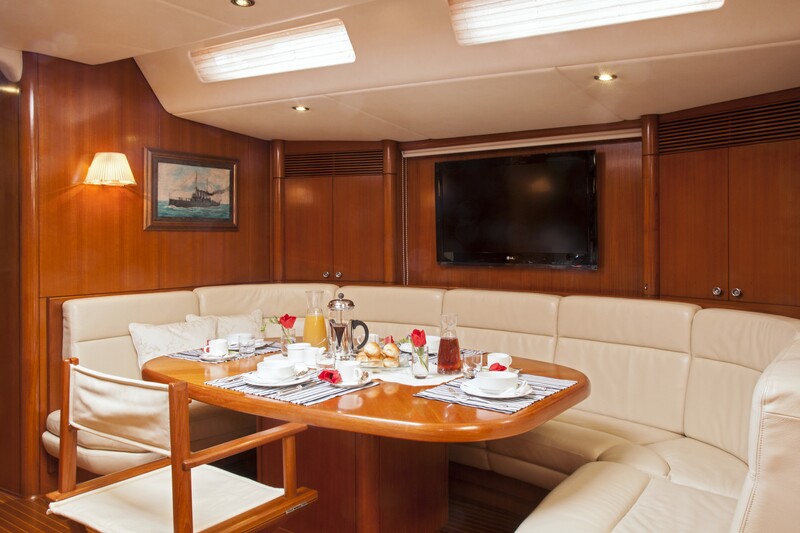 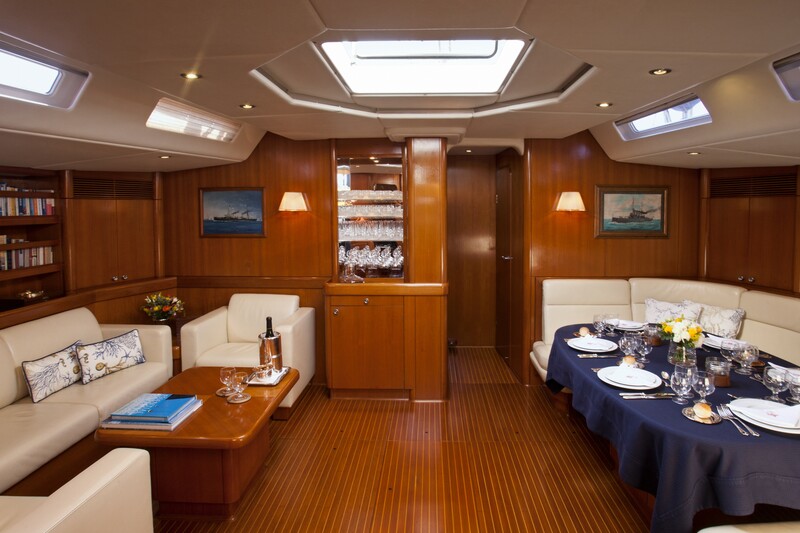 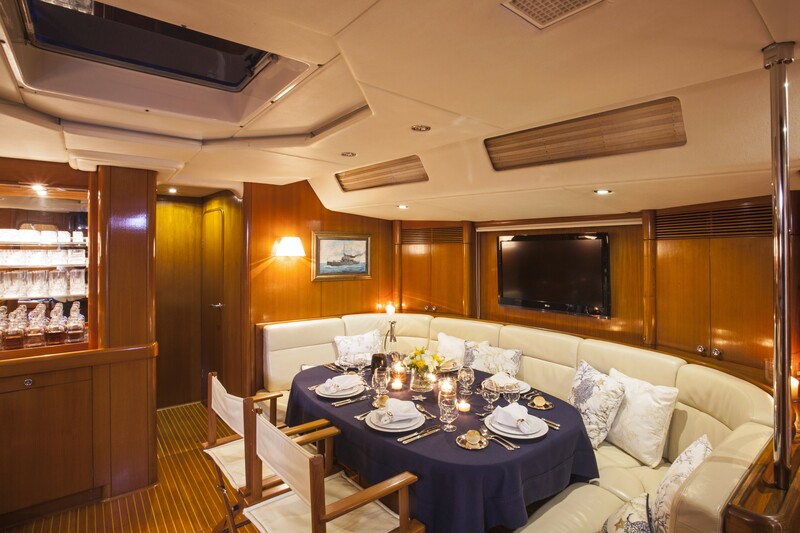 For recreation aboard there is TV, Video, CD and cassette stereo system in the salon area which is the full width of the yacht and feels very spacious. 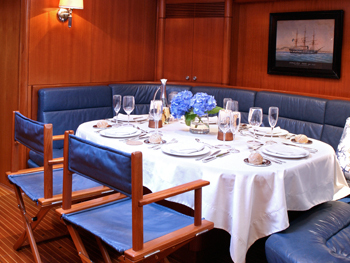 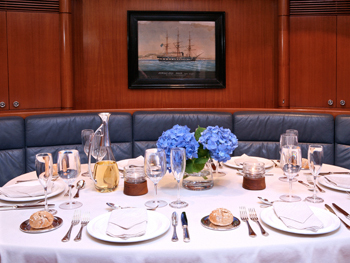 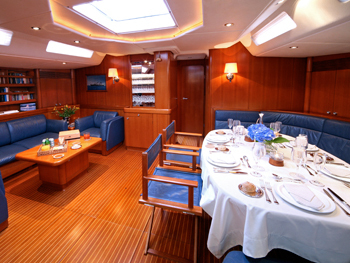 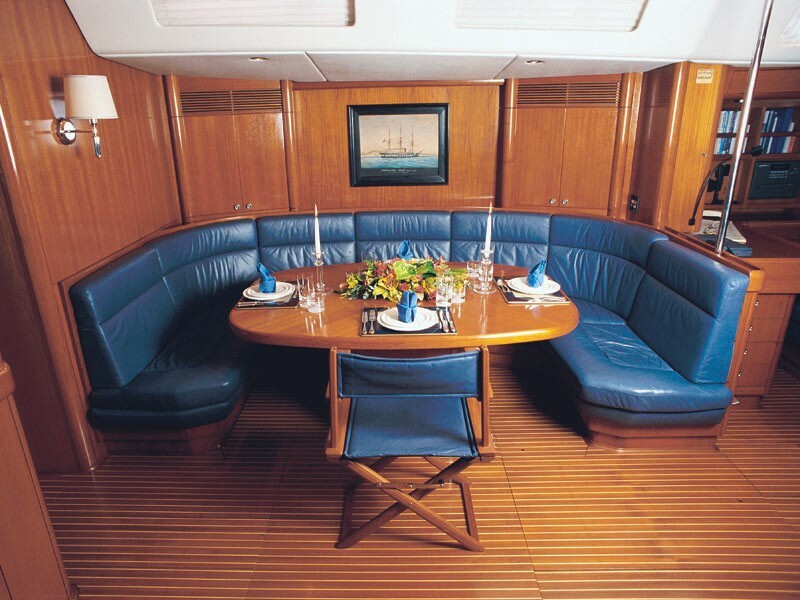 Guests have the choice of formal dining inside as well as alfresco dining in the cockpit. 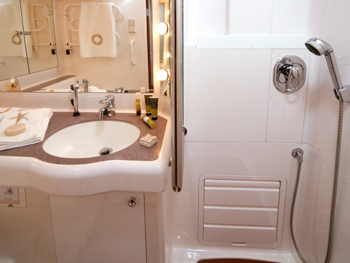 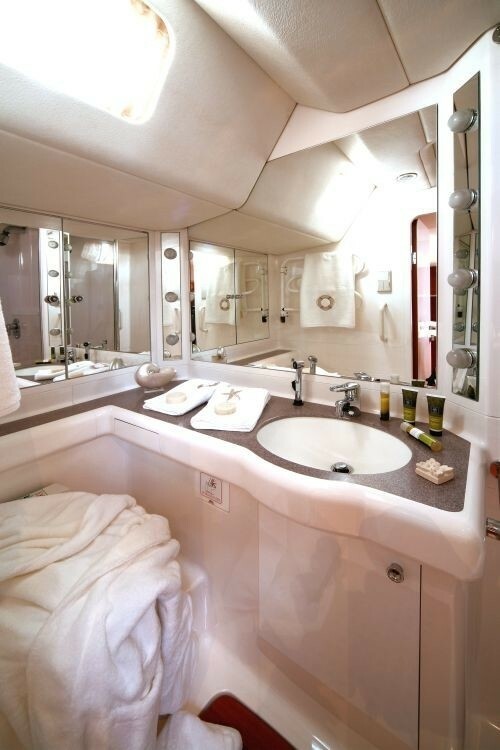 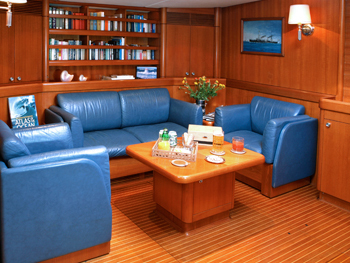 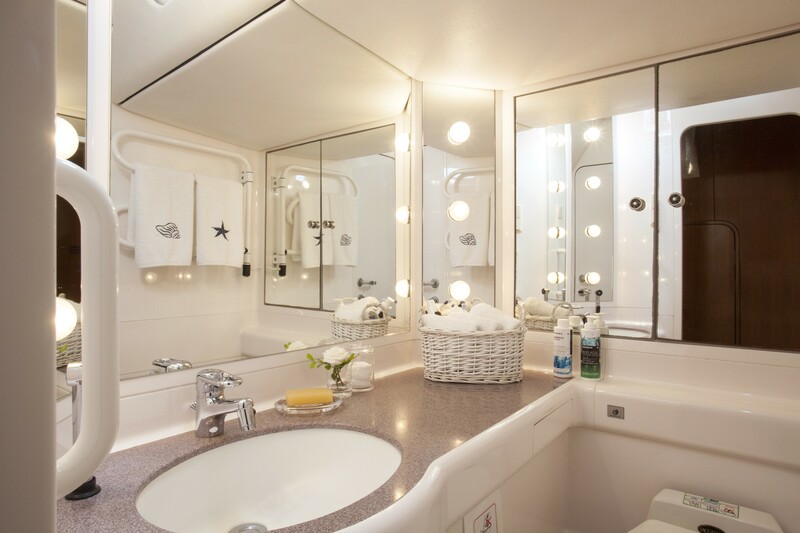 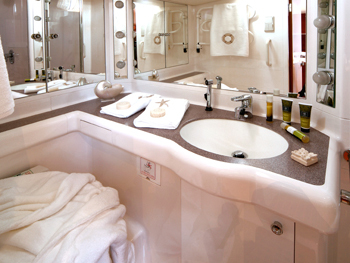 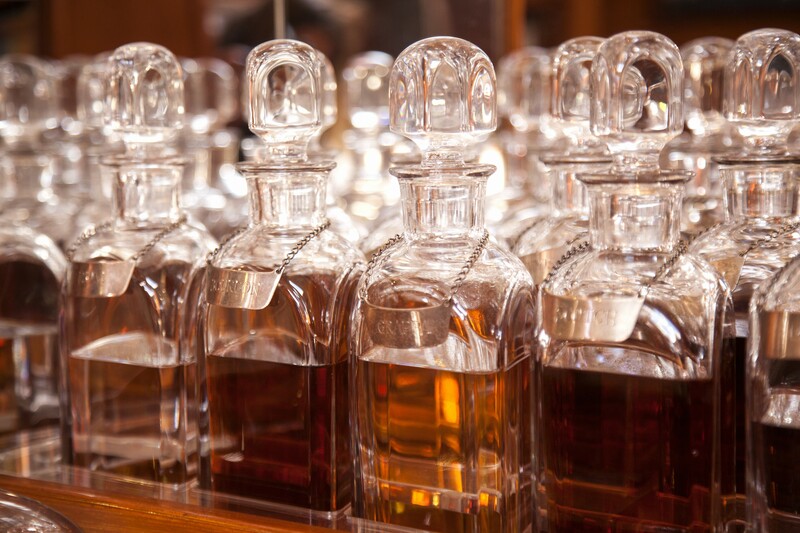 All cabins and the salon are air-conditioned for guest comfort. 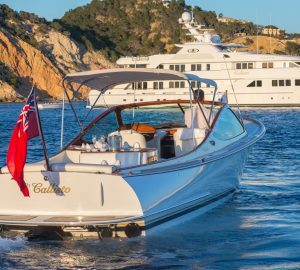 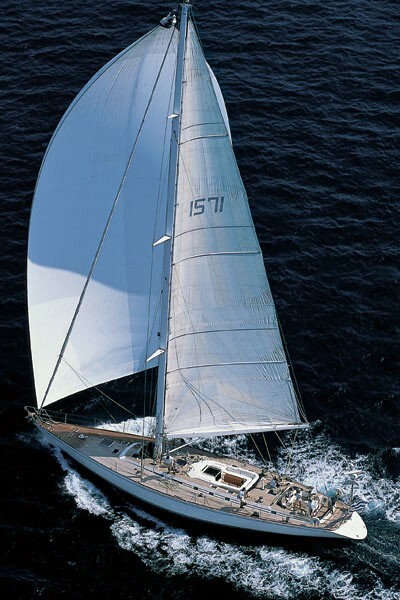 Callisto combines the performance of a world-class racing yacht with a degree of comfort and luxury normally only found on much larger yachts. 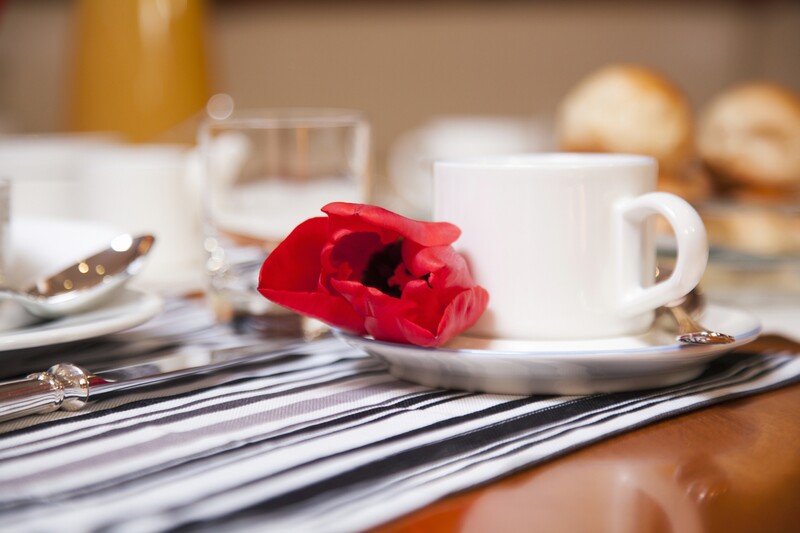 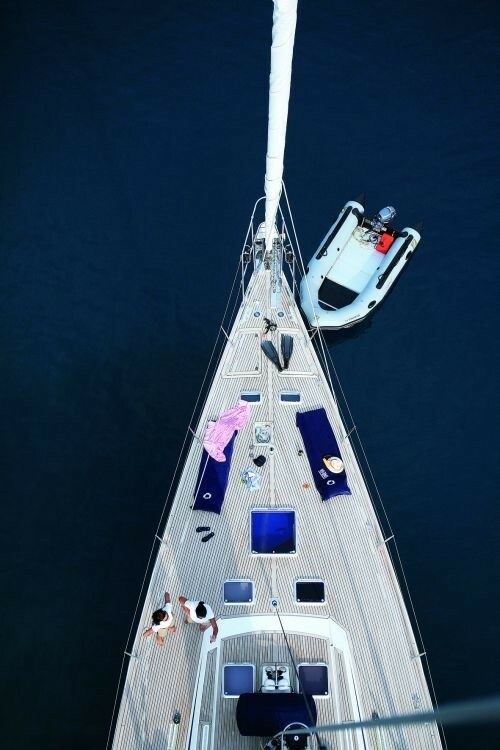 The award winning Chef’s delicious creations will delight even the most discerning client and her professional, longstanding crew will on hand to ensure that this luxury vacation is one you will never forget. 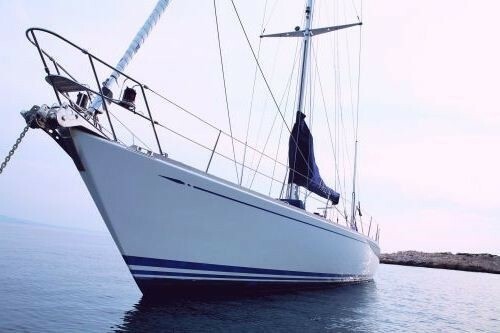 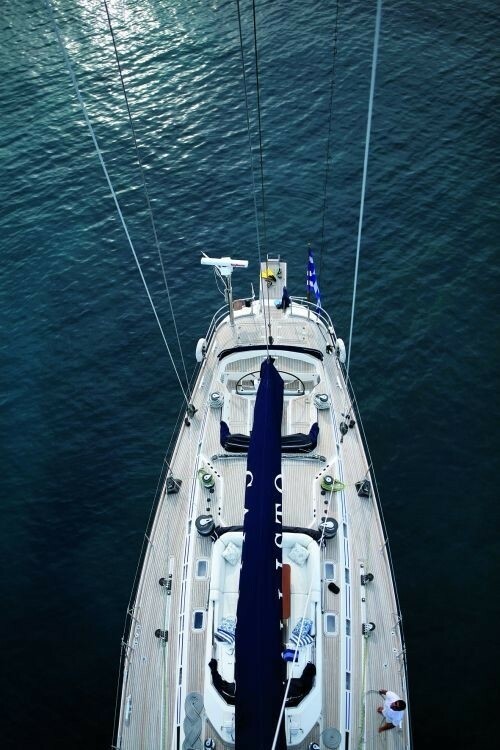 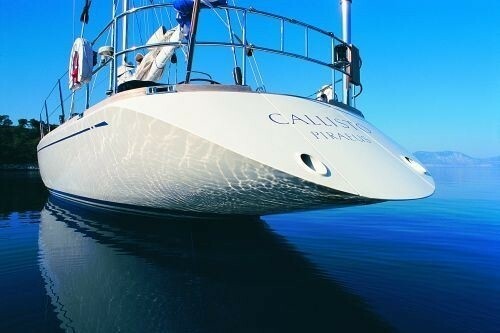 Callisto is a beautiful yacht, she can deliver a unique sailing experience in Greece and has and excellent crew. 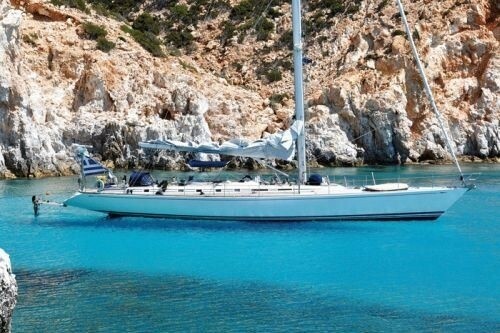 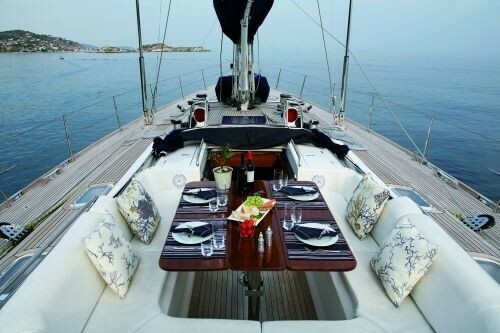 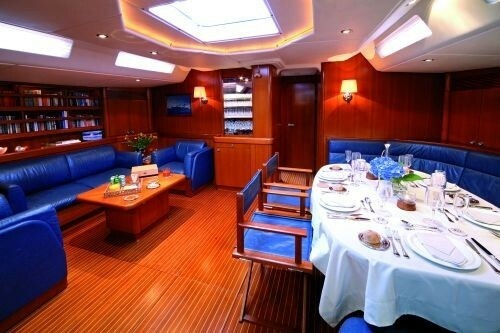 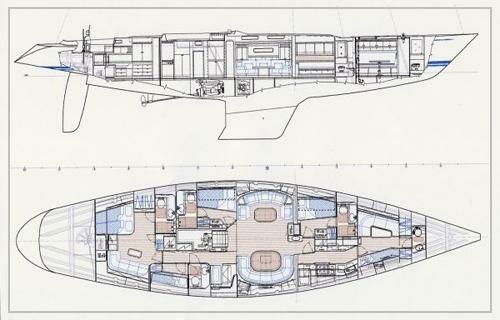 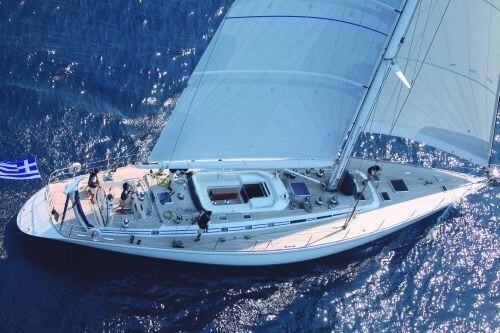 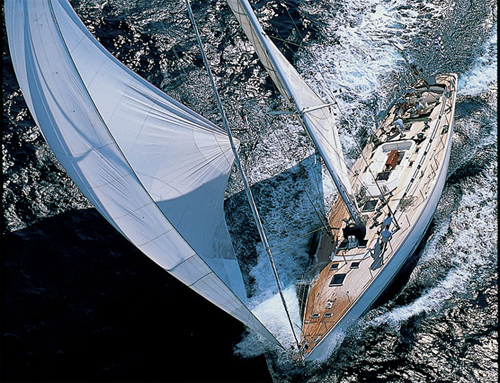 She is a wonderful choice and one of the best sailing yachts available in Greek waters. 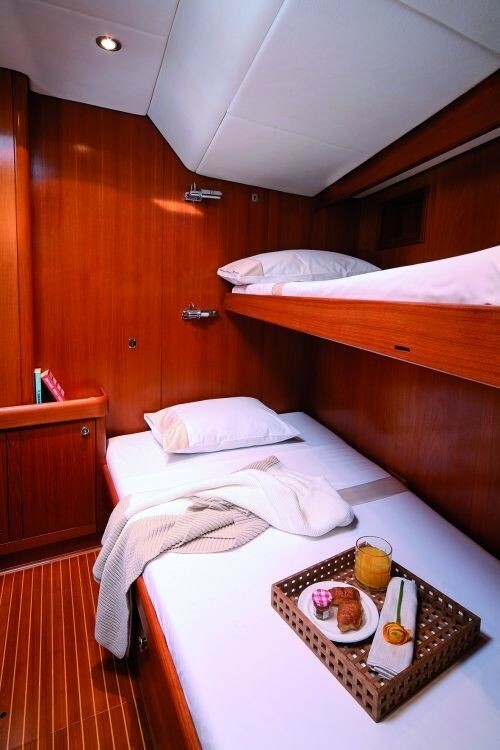 Callisto accommodates six passengers in three cabins – one large master cabin and two double cabins, all of which have en suite bathrooms. 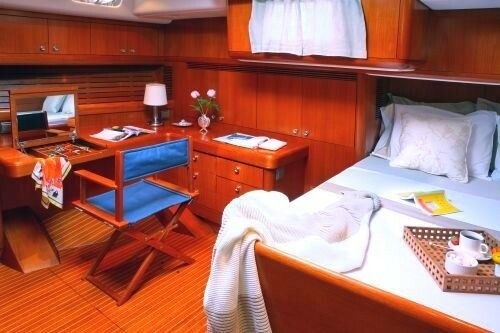 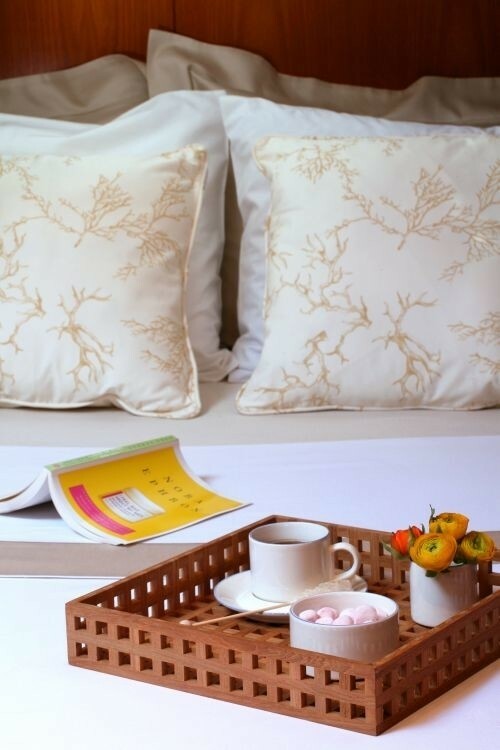 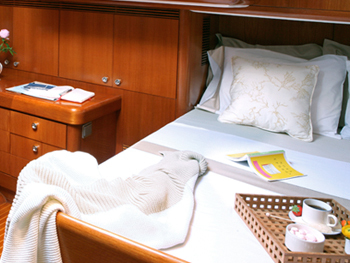 The master stateroom features a queen-sized bed, lounge area and desk. 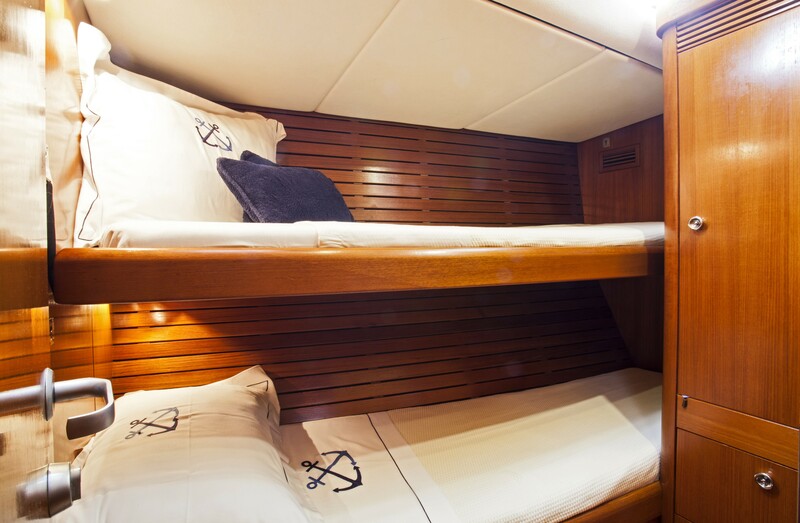 The double guest cabins have a double and single bed. 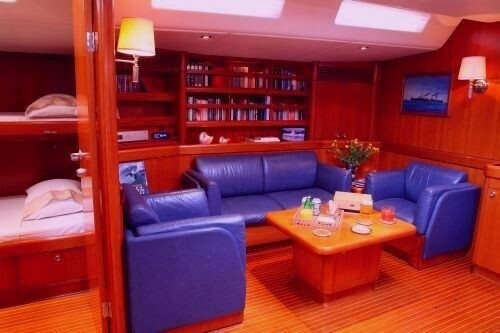 She also has a large spacious full width salon with lounge area as well as a settee for formal dining.